PHOTO: President Russell Begaye stands with Governors from the All Pueblo Council of Governors. Photo from Navajo Nation Press Release. Last Thursday, Navajo Nation President Russell Begaye and Vice President Jonathan Nez met with the All Pueblo Council of Governors. The two governments took a joint stand against fracking and horizontal drilling in Greater Chaco. It was the first meeting of its kind in history. 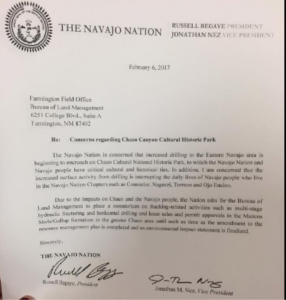 Navajo Nation request for a moratorium on fracking activities in Greater Chaco until BLM planning is complete. In 2014, the BLM admitted they lacked a plan for developing oil and gas resources in the Mancos Shale underneath Greater Chaco. To address this defect, the agency announced intentions to complete a Resource Management Plan (RMP) amendment. Yet, while drafting the amendment the BLM continued to approve drilling leases. By March of 2015, the agency had approved over 130 unplanned fracking wells. Drilling without a plan is unacceptable; so, the San Juan Citizens Alliance and our partners sued the BLM. Our lawsuit demands a moratorium, or a pause, on drilling until the RMP amendment is complete. Fast-forward to today, and the BLM has now approved over 365 wells. The RMP amendment is still incomplete. The BLM’s current deadline hovers around 2019. Hundreds more wells could be drilled before then. Last month, the preliminary “scoping” phase of the amendment drafting process finally closed. Over 5,000 supporters submitted comments opposing unplanned and reckless development in Greater Chaco. Now, the Navajo Nation President is asking for a moratorium. Tribal governments are joining forces. They are asking the United States Government to ensure protections for their sacred sites, their people, and their lands. “We are descendants from the Chaco Canyon area. We are connected to these lands spiritually. The voices of our ancestors live in this area and any disturbance to this area is culturally and morally insensitive,” said President Begaye in a prepared statement. We stand with President Begaye in his request for a moratorium. We stand with the Navajo Nation and the All Pueblo Council of Governors in their defense of Greater Chaco’s culture and people. We stand with the Chapter Houses, local people, and thousands of supporters who have asked for relief from drilling until the BLM has a plan. Our voices are overwhelming and the BLM cannot, and should not, ignore us.